I loved Geekerella, so really wanted to read Heart of Iron. But I think Ashley Poston should stay with Contemporary stories, because I barely cared for Heart of Iron and it couldn’t keep me interested. 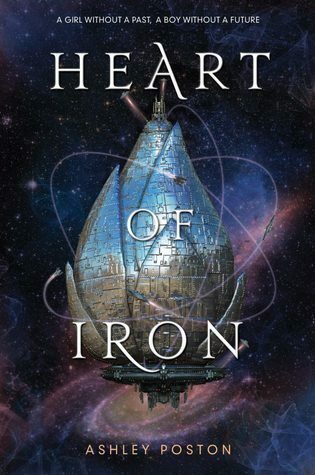 I give Heart of Iron by Ashley Poston two out of five hearts because Ashley could barely keep my interest in the story. I read it in one sitting, but mostly to just finish it and not to have to pick it up another day, with the risk of never picking it up. Ana’s story felt very much like Star Wars and Anastasia and has been done many times before, but this time without any real originality. The world building is not very well done, maybe because the author isn’t very strong at it or not very experienced with it. The book cycles through several narrators, which makes it confusing because I felt they weren’t necessary. I kept losing track on who was where and what was going on before we shifted to one of the different narrators. Ana is our Anastasia and she is almost always accompanied by Di or D09, but because the two names were used interchangeably I kept losing track on whether it was on or two different robots. It was very annoying having to think back on whether they are the same or not. Overall I didn’t like this book, it really makes me hesitate on whether I should be looking forward to the next book in this series, Soul of Stars. I felt the novel was very forgettable and I wouldn’t advice this book since there are so many more better books. I would even tell people to read Geekerella over reading this. This entry was posted in Book Review and tagged Adventure, Ashley Poston, Book Review, Romance, Science-Fiction. Bookmark the permalink.